The soft fibre is impregnated with the KBF99 additive to give the brush its bacteria and fungus killing properties to assist in the prevention of infection and reinfection of various diseases, including strangles, ringworm, E.coli and mycotoxin. Ergonomically designed to be comfortable for the groom, with smooth lines and a soft textured outer casing it is as appealing to the touch as it is to the eyes. 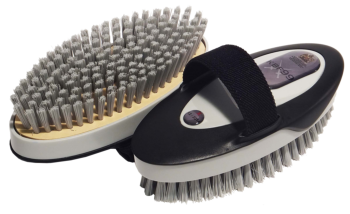 The fibres are impregnated with the KBF99 additive to give the brush its bacteria and fungus killing properties to assist in the prevention of infection and reinfection of various diseases, including strangles, ringworm, E.coli and mycotoxin. It has a wide variety of stable applications and is angled to easily clean the corners of buckets and awkward crevices. The medium stiff fibre is impregnated with the KBF99 additive to give the brush its bacteria and fungus killing properties to assist in the prevention of infection and reinfection of various diseases, including strangles, ringworm, E.coli and mycotoxin. Ergonomically designed to be comfortable for the groom, with smooth lines and a soft textured outer casing it is as appealing to the touch as it is to the eyes. The medium stiff long fibre is impregnated with the KBF99 additive to give the brush its bacteria and fungus killing properties to assist in the prevention of infection and reinfection of various diseases, including strangles, ringworm, E.coli and mycotoxin. Ergonomically designed to be comfortable for the groom, with smooth lines and a soft textured outer casing it is as appealing to the touch as it is to the eyes. The plastic pins are impregnated with the KBF99 additive to give the brush its bacteria and fungus killing properties to assist in the prevention of infection and reinfection of various diseases, including strangles, ringworm, E.coli and mycotoxin. Ergonomically designed to be comfortable for the groom and perfect for gently untangling hair.